In reality, however, many projects don’t require a full-blown module bundler like Webpack but still need a way to compile their front-end assets. Webpack wasn’t designed to be a task runner and so it isn’t easy to configure it to build assets without bundling modules. So task runners like Grunt and Gulp still have their place and we still use both here at Delicious Brains as build tools for different products we develop. In this article, we’re going to look at both Grunt and Gulp to see what their differences are and look at the pros and cons of using each as a build tool for front-end assets. Both of these tools will help you automate the compiling of your front-end assets and make your builds more consistent and reliable, mainly through the use of plugins contributed by the community. 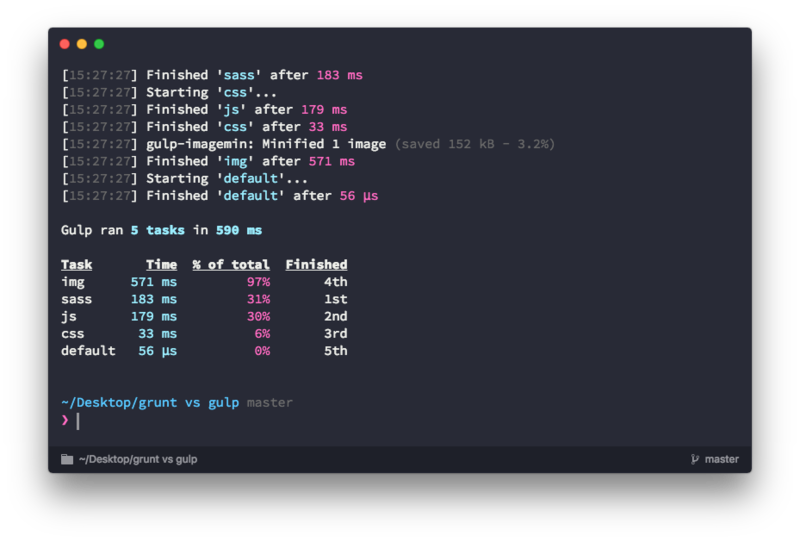 Grunt is probably the more intuitive of the two build tools as it works by defining tasks in a single configuration file called Gruntfile.js. You can specify the configuration for each task and Grunt will run each task in sequence. This makes Grunt files easy to read and understand. One of the easiest ways to compare Grunt vs Gulp is to create the same build script using each tool and comparing the configuration files and performance. So let’s do that. As you can see the configuration of Grunt tasks isn’t very expressive but it is fairly easy to understand. Also because Grunt runs tasks in sequence we can make safe assumptions about things like files being available (e.g. dist-grunt/css/style.css has been compiled before running the concat task). As you can see it is much more expressive and allows us to group things in a more logical manner (e.g., grouping all CSS/JS related tasks). Also because of Gulp’s streams implementation, each task can be run in parallel which is part of the reason it is much faster than Grunt. However, you do have to be careful with this as you need to make sure you don’t break any dependency chains. For example, here we require dist-gulp/css/style.css to exist in the css task, so we need to make sass a prerequisite of the css task to make sure it is run in sequence. So now that we have both of these build scripts up-and-running, how do they actually perform? These results aren’t surprising (as we expected Gulp to be faster) but it does go to show just how much faster Gulp is over Grunt. It’s worth noting that while imagemin took up a big percentage of the process time for both scripts, it seems to run much slower on Grunt but with better compression results. My guess is that this is probably caused by a different default config. On a small project like ours, a difference of 1 second might not be a big deal. However, for bigger projects that speed difference is multiplied and Grunt can end up being much, much slower in total. Personally, I tend to go to Gulp as my first port of call these days, but that doesn’t mean that Gulp is necessarily a better option. The Grunt community is still going strong and both tools look like they’re going to be around for a while yet. Do you use a task runner like Grunt or Gulp to compile your front-end assets? Do you prefer Grunt/Gulp, if so why? Got any good build tool tips? Let us know in the comments. This entry was tagged Grunt, Gulp, Build Tools, Front End.